As its regal name suggests, the Masterpiece Superb is truly the crown jewel of the Vispring luxury bedding collection. The Masterpiece Superb rests on a pair of layers of 1.93” diameter vanadium wire springs, which represent the smallest and most meticulously organized of all Vispring models. With this arrangement, pressure-relieving support per square inch is greater when it comes to body weight, creating a sleeping surface that can respond effortlessly to motion or changes in weight. The Masterpiece also includes a fully blended layer of exotic materials including cashmere, bamboo, and alpaca for a level of comfort that simply cannot be equaled. Besides the Vanadium Wire Springs, the Masterpiece Superb also includes a hand-stitched border with air vents to promote air circulation and temperature regulation. The border is upholstered with all-natural coir and wool and it includes piped ticking to additional softness to the already supremely comfortable mattress. Speaking of wool, the authentic Shetland Isle Wool results in a sleeping surface that does not accumulate humidity. Yet another reason to choose the Masterpiece? It remains the only bed in the world to come delicately enveloped in 100% silk for a sleep that is as comfortable as it is luxurious. 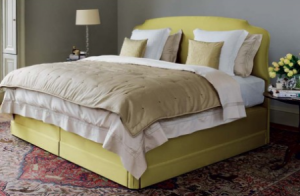 It is a remarkable luxury bed that must be experienced firsthand to understand its incredible comfort. If you would like to schedule an exclusive showing of the Masterpiece Superb, please call Brickell Mattress at 305.326.4000.